ASSAR supported approximately 50 postgraduate students through scholarships for fieldwork and full study programmes. Students also benefited from participating in training and workshop opportunities, attending conferences, and taking part in country-level research and Research-into-Use activities. ASSAR helped me to attain the requisite research skills for undertaking this PhD work. They provided the platform for training and skills development to be able to complete this work on time through various meetings and programs. For example, one important training program was the Climate Training Course held at the University of Cape Town, South Africa … [where] I had the opportunity to meet and interact with researchers from the various participating regions and did learn a lot that changed my world view about research, especially, social research. The [ASSAR] scholarship made my almost elusive dream of obtaining a Master’s degree a reality. Previously, I had not been able to get funding anywhere despite several attempts. The course itself was informative, intense and practical as it was loaded with real situations and examples. It developed my thinking and analytical capacity because I had to review a wide range of literature. Considering the multi-disciplinarity of ASSAR, I have become adaptable to natural and social scientists. I have a background in Agricultural Economics but have slowly moved towards Ecology. Although I wouldn’t say the sailing was smooth, it has been worth the effort! I’ve now become a more well-rounded researcher who is comfortable using a combination of methods. For my poster presentation at Adaptation Futures 2018 in South Africa, for example, I used participatory methods with local communities and remotely-sensed data to get a full handle on the dynamics at play. Abass, R. 2018. Formal and informal institutions in climate change adaptation: the case of Lawra and Nandom districts in the upper west region. Master's thesis. University of Ghana. Link. Link to poster. Angula, M. In prep. A gendered and intersectional analysis for understanding vulnerability to the changing climate within socially diverse Onesi constituency. PhD thesis. University of Cape Town. Link to poster. Bachuri, K. 2019. Assessing the availability, access and use of medicinal plants in the Lawra and Nandom districts of the upper west region. Master's thesis. University of Ghana. Link. Ballo, M. In prep. Effet des changements climatiques et des pratiques agricoles sur la gestion durable des bas-fonds dans le Mali Sud: Cas de Sorobasso et Koumbri dans le Cercle de Koutiala, Bamadougou Bagotière dans le Cercle de Sikasso. PhD thesis. Institut Universitaire de Développement Territorial de Bamako (IUDT). Link. Berthe, T. 2016. La Migration et la Variabilité de la Vulnérabilité des Groupes Sociaux: Cas du Village de M’Pessoba. Master's thesis. Institut Universitaire de Développement Territorial de Bamako (IUDT). Link. Chappel, A. 2018. Barriers and enablers to the adoption of practices to improve crop production and reduce vulnerability to climate risks in the semi-arid Omusati Region, Namibia. Master's thesis. University of Cape Town. Link. Link to poster. Cisse, O. 2017. Analyse de l’évolution des pratiques de pêche dans la commune rurale de Zangasso, cercle de Koutiala au Mali. Master's thesis. Institut supérieur de formation à la recherche appliquée (ISFRA). Link. Dakouo, J. In prep. Agriculture intensification pathways in Koutiala: Implications on access to agricultural natural resource base for different social groups. Master's thesis. Université des Sciences Sociales et de Gestion de Bamako (USSGB). Link. Daou, J. In prep. Effects of agriculture intensification pathways on food, nutrition and income securities of social groups in Koutiala, Mali. Master’s thesis. Institute Polytechnique Rural de Formation et de Recherche Appliquée (IPR-IFRA Katibougou, Koulikoro). Link. Davies, J. 2016. Exploring the factors and actors that contribute to the co-production of climate adaptation plans: A comparison of three municipalities in the Western Cape Province, South Africa. Master's thesis. University of Cape Town. Link. Gitonga, Z. In prep. Leveraging climate information, improved adaptive technology and migration to build resilience and reduce vulnerability of rural communities to climate risks in arid and semi-arid lands. PhD thesis. University of Cape Town. Link. Haukongo, C. 2017. An assessment of determinants of adaptive capacity of livestock farmers to climate change in Omusati Region. Honours thesis. University of Namibia. Link. Link to poster. Joshi, N. In prep. Barriers and enablers to the sale of livestock in Omusati, Namibia. Master's thesis. University of Cape Town. Koomson, E. In prep. 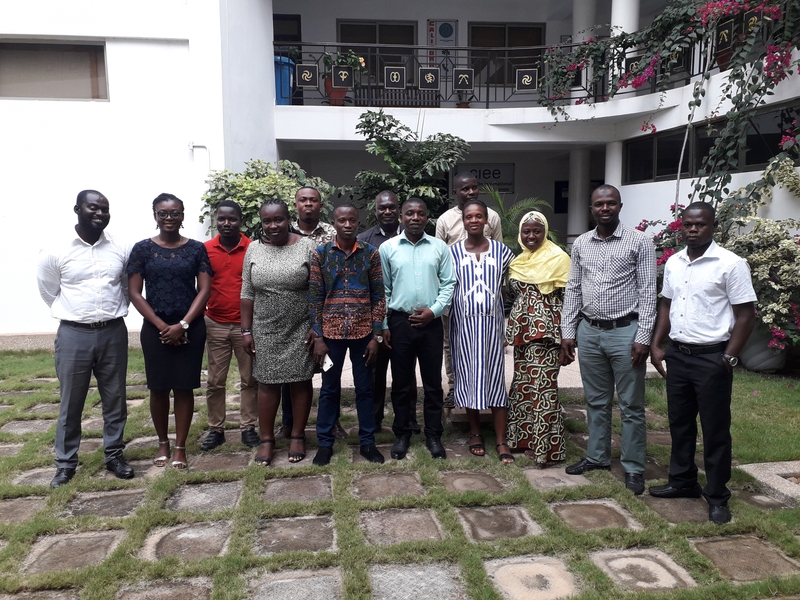 Enhancing the provision and management of ecosystem services in agricultural landscapes for climate change adaptation in the upper west region of Ghana. PhD thesis. University of Ghana. Link. Kumadey, C. In prep. Improving market systems for non-timber forest products as a climate change adaptation strategy: A case study of Lawra district. Master's thesis. University of Ghana. Link. Mosime, B. 2018. The use of traditional weather forecasting by agro-pastoralists of different social groups in Bobirwa sub-district, Botswana. Master's thesis. University of Cape Town. Link.Link. Mulwa, C. In prep. Managing vulnerability to risks in smallholder farming: Essays on sustainable agricultural intensification and climate change adaptation in developing countries. PhD thesis. University of Cape Town. Link. Musingarabwi, S. 2016. Time-use and wellbeing in Onesi, Namibia. Master’s thesis. University of Cape Town. Link. Omari, S. In prep. Vulnerability and adaptation of farming households to climatic and non-climatic stressors in semi-arid Ghana. PhD thesis. University of Ghana. Link.Link to poster. Plea, A. 2016. Stratégie d’Adaptation des groupes sociaux face aux changements climatiques: Cas du maraîchage dans le village de Koumbri (Commune de Yognogo, Cercle de Koutiala). Master's thesis. Institut Universitaire de Développement Territorial de Bamako (IUDT). Link. Poniso, A. L. 2017. An assessment of impacts of climate variability on key forest ecosystem services and livelihoods of communities in Onesi constituency, Omusati region. Honours thesis. University of Namibia. Link. Rathore, D. 2017. Blackbuck occupancy in Moyar Valley, Tamil Nadu. Master's thesis. TERI School of Advanced Studies. Link. Sajith, S. 2017. Changing cropping patterns and its implications on household food security and nutrition. Master's thesis. TERI School of Advanced Studies. Link. Salifu, A. R. 2016. Social differentiation in livelihood vulnerability and adaptation: A study of groundnut production in the upper west region. Master's thesis. University of Ghana. Link. Link to poster. Sanga, U. In prep. A resilience-based approach to modelling food security and climate change adaptation among rural farmers in southern Mali. PhD thesis. Michigan State University. Link. Sanogo, T. 2017. Changements climatiques et gouvernance des ressources pastorales dans la commune rurale de Sincina Cercle de Koutiala, Mali. Master's thesis. Institut supérieur de formation à la recherche appliquée (ISFRA). Link. Shooya, O. 2017. Barriers and enablers to water access and community wellbeing in the Onesi constituency of Namibia: The case of Okalonga B and Onandjandja villages. Master's thesis. University of Cape Town. Link. Tiyumtaba, S. M. 2016. Climate change adaptation strategies of small livestock farmers of Nandom and Lawra. Master's thesis. University of Ghana. Link. Link to poster. Traore, A. In prep. Effect of agriculture intensification on the production of maize in the district of Koutiala, Mali: Case of the village of N’Goutjina. Master’s thesis. Institut Polytechnique Rural de Formation et de Recherche Appliquée (IPR-IFRA, Katibougou, Koulikoro, Mali). Link. Yidana, A. A. 2016. Social differentiation in the vulnerability and adaptation patterns among smallholder farmers: Evidence from north western Ghana. Master's thesis. University of Ghana. Link. Zulfawo, T. A. 2016. Exploring the competing uses of water in the context of climate variability and change in the Lawra district. Master's thesis. University of Ghana. Link.